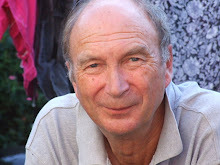 For walkers, small town French tourist offices can be a precious source of information. Ask staff to recommend a route and invariably - sometimes for a nominal sum, sometimes free - they will provide a leaflet with details of a suitable ballade. If you catch them open, that is. They keep frustratingly bureaucratic hours. Hoping to make an early start you seek one out after breakfast, only to learn it doesn't open until 10am. Arriving somewhere in time for an afternoon walk you find they won't be back from their midday break until 3pm. On Sundays they may not open at all. At Mezieres-en-Brenne we sneaked under the wire. Staff could already smell lunch but before they locked the door they came up with a neatly laminated map. It was just as well, for the area was new to us. Our decision to detour there had been made on a whim. The sun was shining, we had bought a picnic of fresh goat's cheese from a farm and pork rillettes from a market stall and we didn't fancy wasting any more of the day driving. The Parc Regional de La Brenne, is an hour or so south of Tours in the Loire Valley and west of the autoroute from Paris to Limoges. We had driven there from Dover after a crossing with P&O Ferries from Dover, stopping for a couple of nights not fare from Amboise (see earlier blog: French hotel pick: the Loire). You could go straight there in a day from Calais but you would need to catch an early ferry. The park is a mozaic of glittering lakes, man made in the Middle Ages, widely used for fish farming and more recently recognised as an important wetland complex, rich in birds, among them egrets, bitterns and marsh harriers. It is tranquil, magical and a little mysterious. 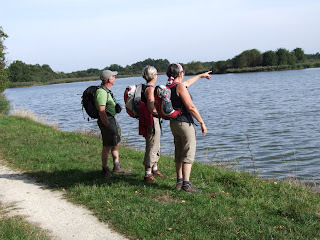 Armed with the tourist office map we found the start of an itinerary which skirted the Etang de Piegu. We could have sat at its margin for hours, watching a distant heron and a huge flock of fitful lapwings, but dinner called, with a cassolette - a mixed haul from the lakes including crayfish and carp - back at the 17th century inn where we spent the night. At Nasbinals, much further south in the Departement of Lozere we missed the boat. Lunch was already well advanced. If we waited for the tourist office to reopen there would be no time for a worthwhile afternoon walk. A different solution emerged, however. This is one of an apparently increasing number of towns erecting information boards showing the length of hikes and the their colour codes. Follow the markers with care and you can dispense with a map altogether. 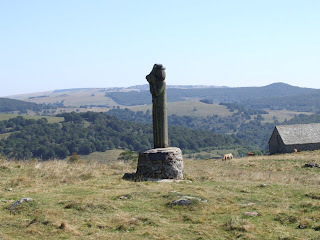 Nasbinals lies on the on the causse, or plateau, of Aubrac. The plateau is high, sometimes windy and cold enough in winter for skiing. In spring, garlanded, long horned cattle are driven up from the valleys, an annual transhumance ritual watched by thousands of sightseers. 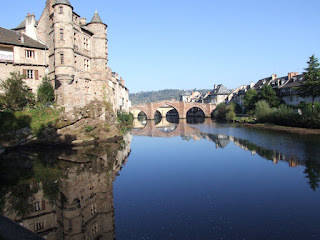 We picked an itinerary which took us around 3hrs 30mins and finished, intoxicated by sweeping views, in time to drive down to the Lot Valley where we had booked into an auberge in the lovely riverside town of Estaing. Next morning we dropped into the tourist office in nearby Espalion and were provided with details of several walks, including on of 5hrs 30mins which took us on long climb back to the same causse on one of the pilgrimage routes to Santiago de Compostela. As we headed up we were passed by a steady trickle of modern day pilgrims heading down, going all or part of the way to Spain. The route started and ended in St. Chely d'Aubrac, the stones of whose narrow, medieval bridge have been worn by centuries of worshippers. It is worth standing there for a moment to consider them, carrying the scallop shell symbol of St. James, penitent or merely curious, anxious to register credit for a comfortable afterlife or perhaps even journeying as mercenaries, paid to make the trip on behalf of those seeking to buy their escape from the divine naughty step. But on most walks we encountered hardly another soul. 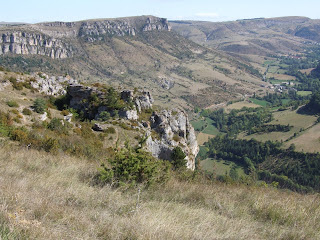 Thus it was above Meyrueis in the Cevennes, where where we followed an airy track along the limestone rampart of the Causse Mejean. Northward lay a grassy plateau grazed by sheep whose milk is used to make Roquefort and other blue cheeses. The the south the ground fell away to a valley, rising again as thickly wooded slopes. As we rested in a sort of rocky theatre box a hawk, targeting some unseen prey below the rocky lip, plunged only a few feet over our heads, wings swept back, like a heat seeking missile. Griffon vultures circled low, as if checking us out. Meyrueis, is an atmospheric little town, with a photogenic sweep of old terraced houses, built at the eastern end of the spectacular Jonte gorge. It is a superb walking base – but that was not the only reason we stayed there longer than intended. Daniel Lagrange's cooking at the Hotel de Mont Aigoual was consistently stunning. On the first evening they brought me duck instead the dish I had ordered. It was a happy mistake. The duck breast, cooked a point, or medium rare, and accompanied by an intriguing little compote of pineapple and ginger, was tender and delicious. Whether it was a starter of snails or a main course of guinea fowl or lamb cooked for seven hours, the magnificent local cheeses, a trio of sorbets enlivened by slivers of citrus peel or the home made plum jam for breakfast, nothing disappointed. The local Office de Tourisme provided another reason to linger, a whole folder full of walks, modestly priced and clearly described (in French, though fellow hikers said they had been offered the same in English) and designed as a series of separate leaflets). And for the record, it opens at 9am.